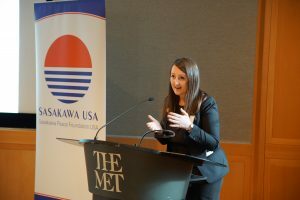 On January 12, 2019, the Japan Exchange and Teaching Alumni Association of New York (JETAANY) hosted an event at the Metropolitan Museum of Art (The Met) in Manhattan focused on how art and culture can help strengthen and express the U.S.-Japan relationship and promote mutual understanding. 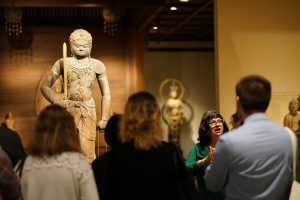 The Met offers a world-class collection of Japanese art and this event offered three docent led tours of the collection followed by a panel discussion on the role of art in U.S.-Japan relations. 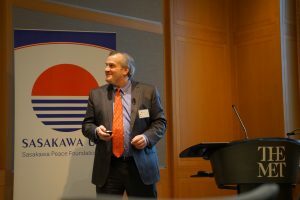 The event was supported by the USJETAA/Sasakawa USA Chapter Grant program. 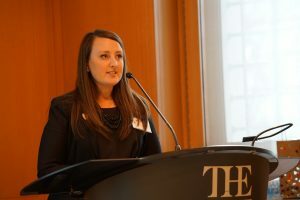 The event brought together over 70 attendees, excluding speakers. The alumni represented the JET Program across 29 years, from 1990 to 2018, who lived in 29 different prefectures. Present were five of the seven board members of USJETAA: Keith Krulak (treasurer); Laurel Lukaszewski (secretary); Monica Yuki; Mark Frey; and, Executive Director Bahia Simons-Lane. Additional attendees recognized as “Friends of JETs” included Japanese nationals, academics, and Japanese governmental staff. In the morning, guests participated in private docent-led tours of The Met's Japanese art collection. Each group was led by a professionally trained docent or art history expert working for The Met. The Japanese art collection included highlights from Neolithic ceramics (ca. 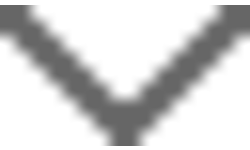 1500–300 B.C.) to Edo-period (1615–1868) woodblock prints and textiles, as well as contemporary ceramics. 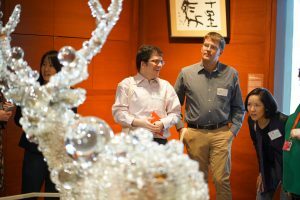 The tour culminated with a look at the intriguing PixCell-Deer#24 by Kohei Nawa (2011)and a buffet lunch with sandwiches and desserts. After lunch, attendees sat in formal seminar hall at The Met. 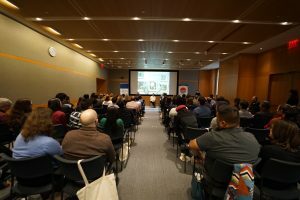 The program began with remarks from JETAANY’s president, Brenda McKinney; USJETAA's Executive Director, Bahia Simons-Lane; and, the Consul General of Japan in NYC, Ambassador Kanji Yamanouchi. 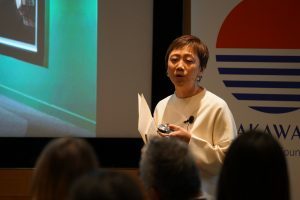 Brenda briefly welcomed everyone and acknowledged the diverse group of attendees, including USJETAA's board of directors and the JET Program coordinators from the Embassy of Japan in Washington, DC. Bahia introduced the chapter grant program supporting the event and the funder, the Sasakawa Peace Foundation USA. 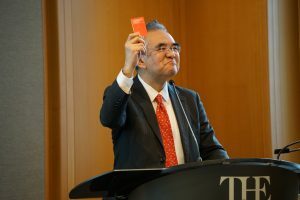 Ambassador Yamanouchi opened with some humor and expressed his support for the JET Program, the more than 70,000 alumni internationally, the event sponsors (USJETAA and Sasakawa USA), and also stressed the importance of U.S.-Japan relations. He said that he was proud to see JET alumni in every corner of the world. 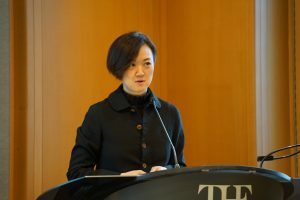 The session was moderated by Dr. Miwako Tezuka, Co-Founder and Co- Director of PoNJA-GenKon, also known as the Post-1945 Japanese Art Discussion Group, and a former Director of the Japan Society Gallery. 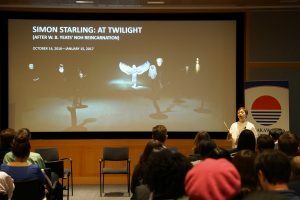 Panelists spoke for about one hour and offered intimate and nuanced views into the role of art within the U.S.-Japan relationship as well as explored the history of Japanese art in the United States. Some highlighted parts of the discussion follow. John Carpenter began the discussion by explaining how after World World II, there was an influx of Japanese art into the United States. The Japanese art collection of Harry Packard was purchased by The Met in 1975 and formed the basis of the current collection, along with financial support from the Japanese government and Japanese corporations. In the 1960s and 1970s, Japan was seen as a gateway to Asia and there was a flow of artists between the two counties, where artists acted as cultural ambassadors. The Japanese government also believed that by supporting Japanese art and artists abroad, they could promote mutual understanding and appreciation for their cultural heritage around the world. As a result, Japanese art is relatively “cheaper” to acquire compared to Chinese art which is strictly controlled by the government. Yukie Kamiya followed by sharing the Japan Society’s longstanding history of fostering cultural exchange and understanding between Japan and the United States since its founding in 1907. The gallery features both contemporary and traditional Japanese art exhibitions at its headquarters in downtown Manhattan. She also encouraged audience members to see their current exhibition, Yasumasa Morimura: Ego Obscura, which was on its last weekend of showing. The exhibit featured contemporary artist Yasumas Morimura and his 30-year-long project of excavating “the self” from layers of art history, Japanese post-war history, and personal history. 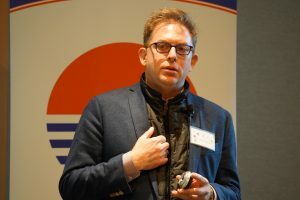 Brett Littman shared a story about his personal connection to Japan and how he visited the Noguchi Museum as a child. As a Japanese-American sculptor, Isamu Noguchi exemplified an artist who straddled the two cultures and that intrigued Littman. As Noguchi became politically active during WWII due to the treatment of Japanese-Americans during that time and this influenced his art. He collaborated with both Americans and Japanese until his death in 1988, which was unusual for many Japanese artists at that time. Littman mentioned that at times Noguchi struggled with his identity in the Japanese art scene because his perspective was so different from his contemporaries in Japan. 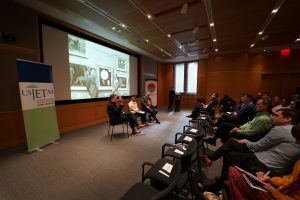 The speakers also answered questions from the audience about the importance of framing Japanese art properly to acknowledge the role of colonialism in art collections and how to address issues of cultural appropriation, such as the 2016 controversy at the Boston Museum of Fine Arts surrounding the display of Monet's “La Japonaise” where viewers were invited to try on kimono and pose with the painting. The event ended with closing remarks from Brenda McKinney and Joy Champaloux from Sasakawa USA. 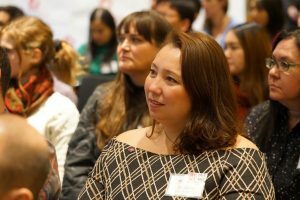 Through the USJETAA/Sasakawa USA Chapter Grant program, USJETAA and Sasakawa USA aim to help chapters strengthen the JET alumni network and elevate their leadership role in their local community by hosting innovative activities that promote stronger U.S.-Japan relations. 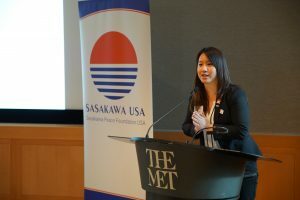 USJETAA congratulates JETAANY for organizing such a successful event that engaged the JET alumni community in New York on Japanese art and U.S.-Japan relations. All photos by Kotaro "Tony" Kashiwai.